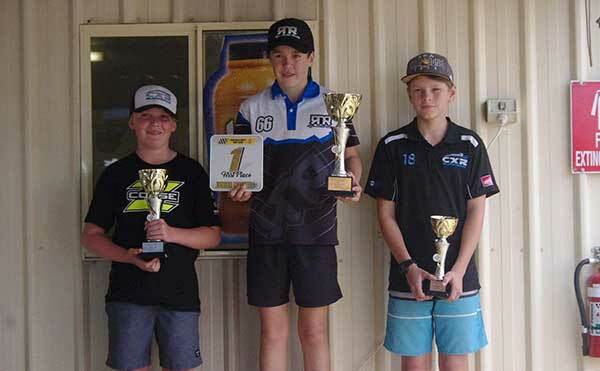 What a fantastic weekend of racing at Cooloola Coast Kart Club! It had everything from drama, excitement, thrills & spills. 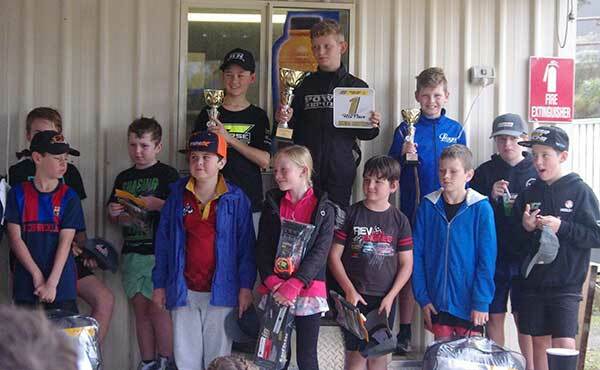 Club President Peter Phillips was very happy with the field of 59 junior drivers that fronted up for this race meeting. 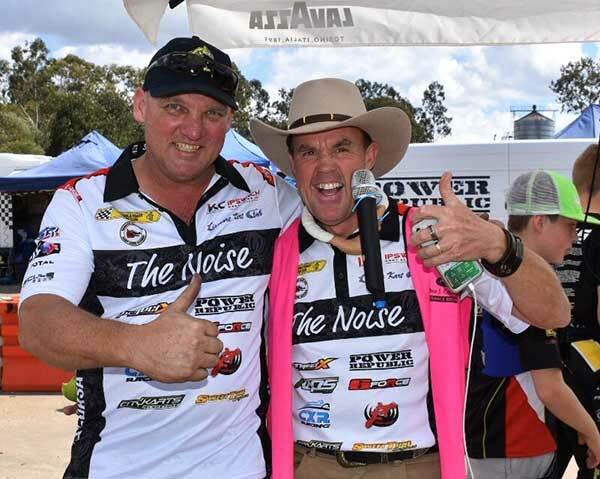 Cooloola club President Peter Phillips (left) wearing his new “The Noise” polo alongside the real Noise! 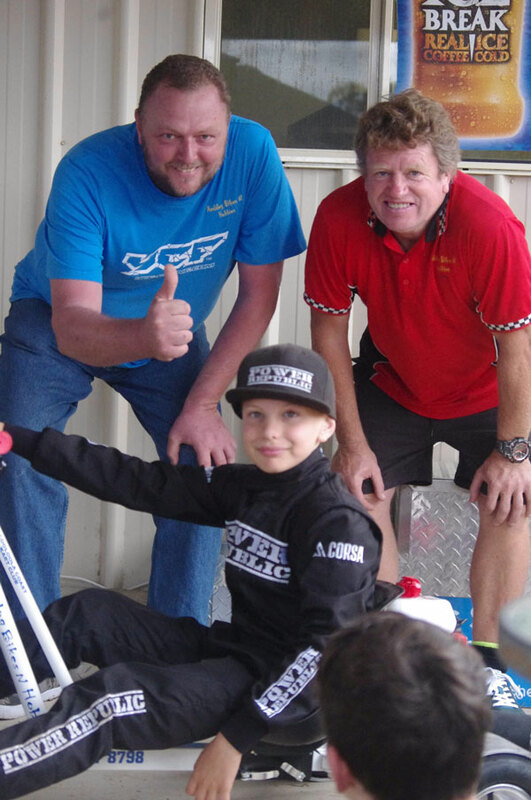 Two major random prize draws were to be held at the end of the weekend and the prizes kindly donated by David & Lee from Reddog Trikes and Hobbies in Gympie were two fabulous motorised drift trikes! And the unfortunate Rhys Suffolk must get a mention first after showing great pace for a podium, didn’t start the second day after a day 1 accident injured his arm leaving him unable to continue. 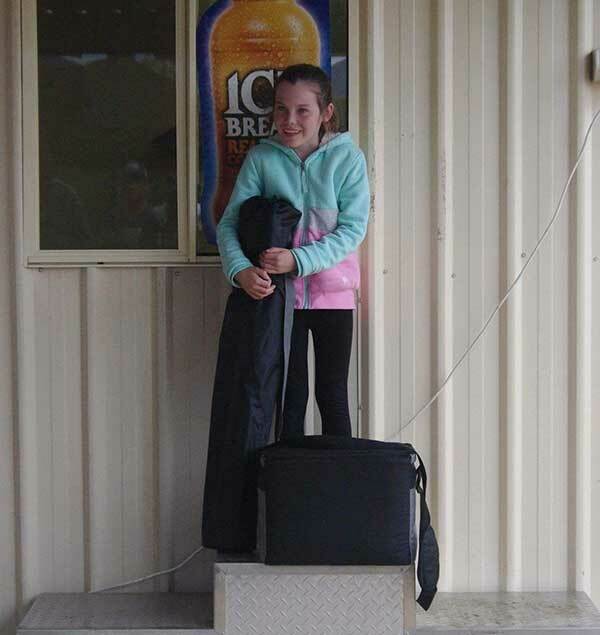 Driving to a fabulous 6th place was little Mackenzie Wagner who is so small. Still, that once the helmet is on, she is almost the size of a “mini me” and she loves interviews too!! 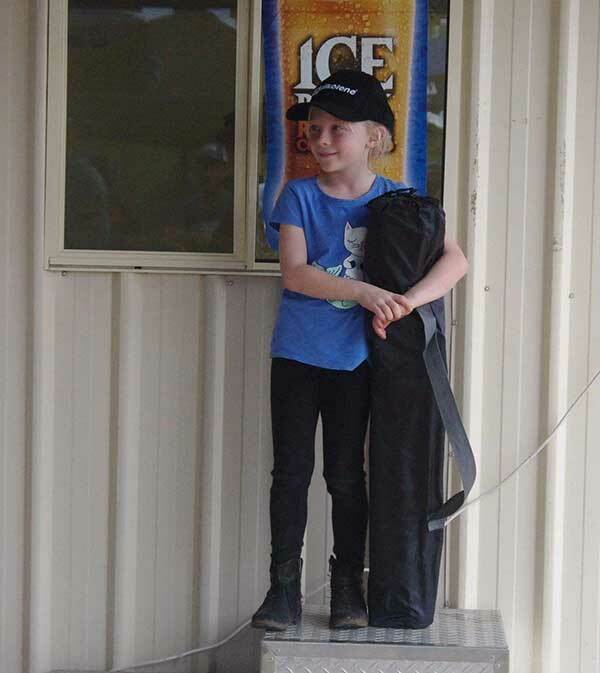 Grabbing 5th spot was the equally at home Harper Brown who’s highlight of the weekend, apart from taking over the microphone, has to be a 3rd place in heat 3. Finishing just outside the podium spots was the very consistent Rylan Hovey. Moving onto the podium then, and in third it was the flying No 70 of Dominique Penman, bringing it home second was the hard charging Tameka Dyne. And the winner was unstoppable all weekend long, Sam McDermid. After showing some real pace early in the weekend it was a couple of small mistakes in treacherous conditions that undid the charge of Jordan Sell who finished up 6th. Luke Rinaldi drove really well all weekend long and managed a 5th place. 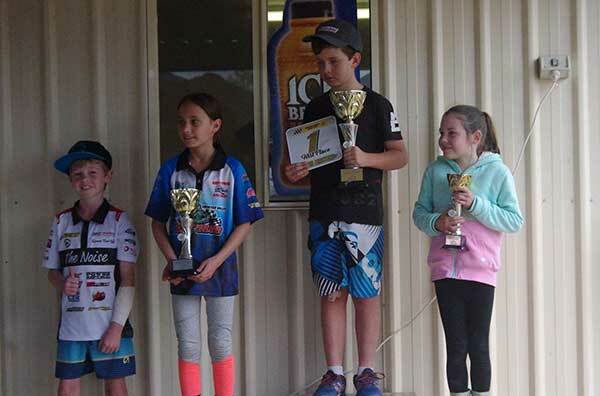 It was an outstanding weekend to say the least for the fabulous little girl racer Oceana Colangelo who finished 4th just outside the podium with a highlight of the weekend an amazing second place in heat 3. And onto the podium positions, coming home third was the fabulous Isaac McNeill who battled illness all weekend so it’s an even more impressive achievement! 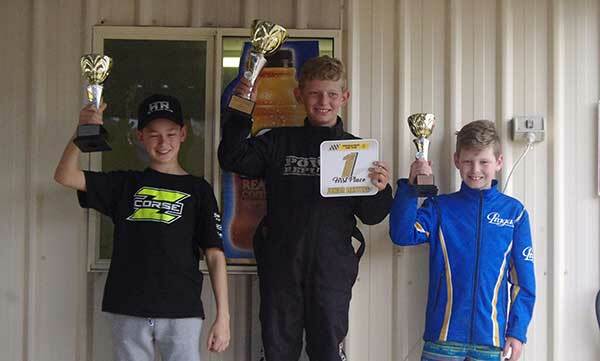 Getting second place after what can only be described as an epic weekend of battles for 1st place with the best name in karting, Mika LeMasurier! And finishing on the top step (yet again! He’s getting used to it now! ), the Tempur sponsored No 98 of Jackson Cooper. Hayley Dunston & Ryan Silcock didn’t start this one but getting the third place on the podium after what can only be described as one of most dramatic finals was Ari Wedlock. He was battling all weekend for the lead but 3rd place it was. Giving Ari those battles all weekend long was eventual 2nd place finisher Jake Czislowski. They were both good enough to win this but it just wasn’t their weekend. 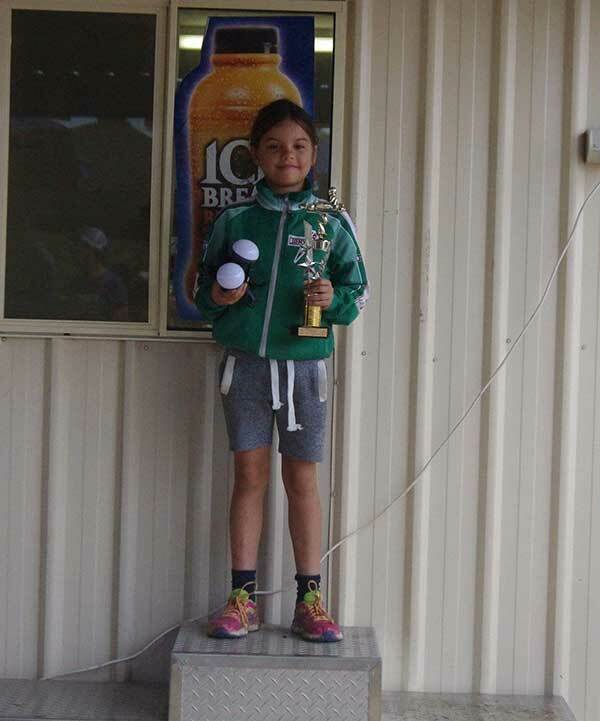 Taking victory after the most impressive showing of consistent driving in sometimes very difficult conditions was the fabulous Lilly Stevens! Starting with the 5th placegetter, and he was in contention for a podium all weekend, the ever improving Power Republic driver Beau Bromhead. 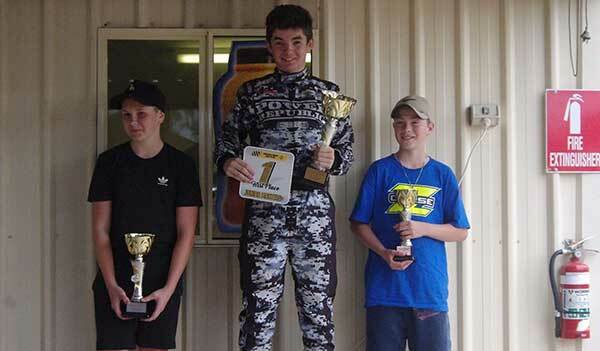 The Corsa apparel driver Lachlan Platten got him self 4th after an eventful final could so easily have seen him on the podium as he had the pace. 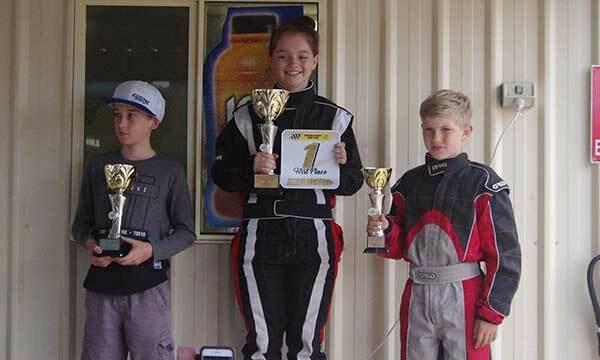 Onto the podium then and in 3rd it was an excellent drive from the Lismore flyer Kyser Kyle Suffolk. In second the pirate racer ooooaaarrrrrr Coby Govoni! 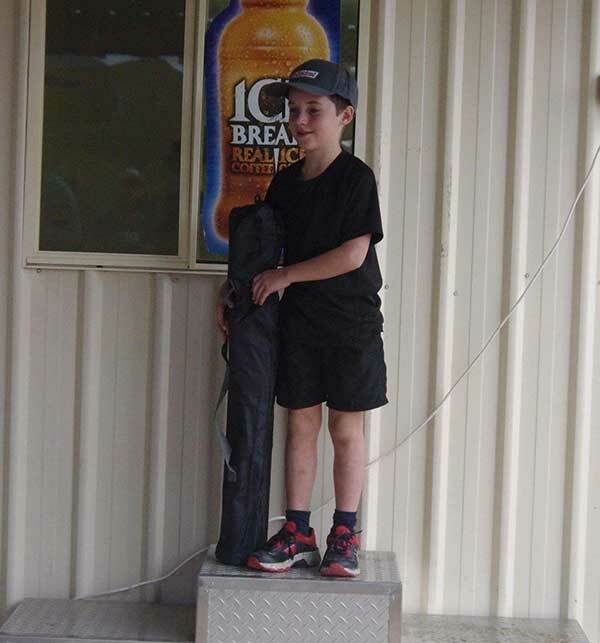 But taking the victory after a masterful drive all weekend long and looking unstoppable was Samuel James. We have to mention Chad ‘holeshot’ Sampson first who was holding a comfortable 2nd place in the final when the heavens opened and the wet track caught him out crashing with just 2 laps to go! 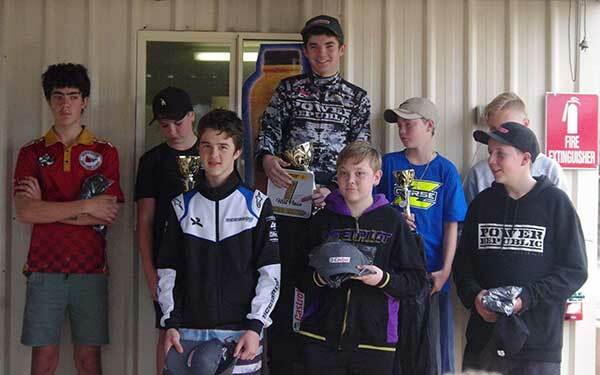 In 5th place it was the hard charging Luke Smith, finishing in 4th just outside the podium was the flying number 2 Dylan Dunston who was charging hard. Onto the podium and in 3rd it was the #25 of Tyson Jennings and well deserved too! 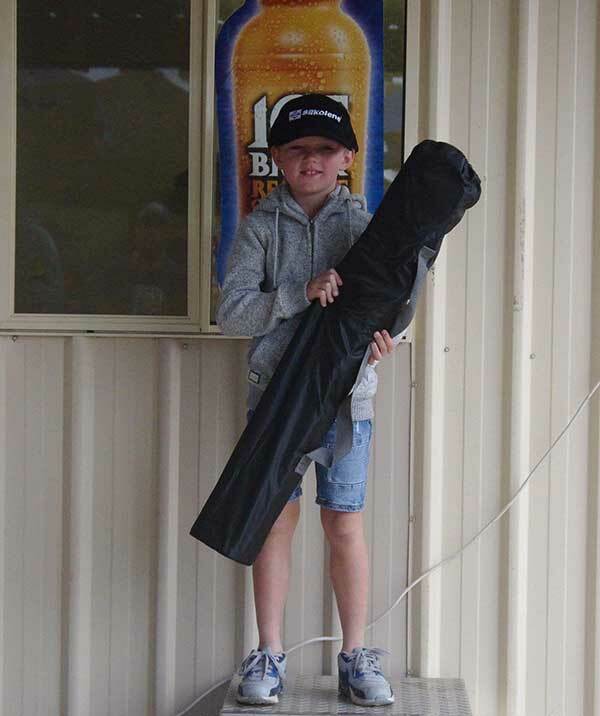 In second it was Tristan Griffin who came all the way from the back after a 1st lap incident, and had dad Matt on the sidelines to watch after just coming out of hospital – a happy camp all round! But the win went to the unstoppable Tommy “the hitman” Cooper who is so dominant in this class at the moment! Starting with 5th place getter, and it was the hitman Tommy Cooper driving this class for the first time in a few years, and but for engine dramas on the day, one could have been nearer the podium. In 4th the ever improving alien tech driver Alexander Hadden. Onto the podium and a well deserved 3rd for local driver Jack Munro sporting one of those new aero packages on the kart! In second, after dominating day one, was Zedcorse driver Zane Rinaldi. But the win, and what an impressive win it was too – he didn’t panic on day 1, he just gradually worked on the setup and got faster & faster – was the flying #66 of Ryan Newton. Two special awards were given out at the end of the weekend chosen by Kev “The Noise” Davies. 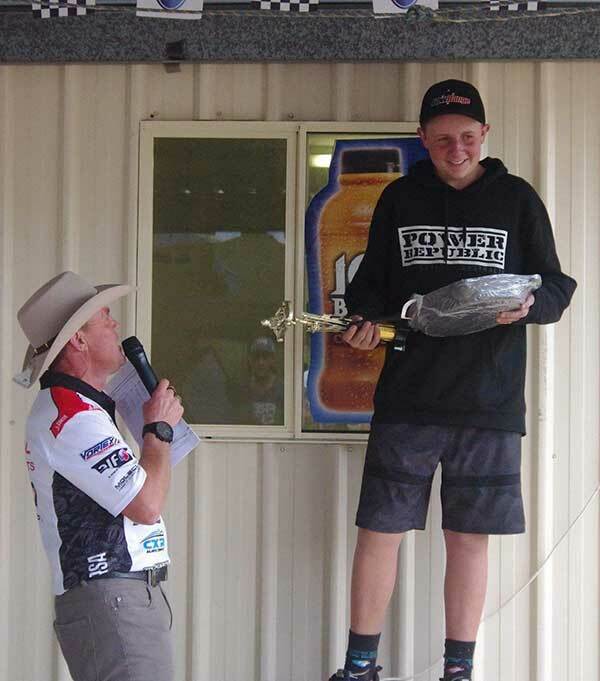 In the juniors I gave the Lenore Leavey rising star award to a well deserved Chad “holeshot” Sampson. He so nearly got second place and drove the wheels off the kart all weekend! 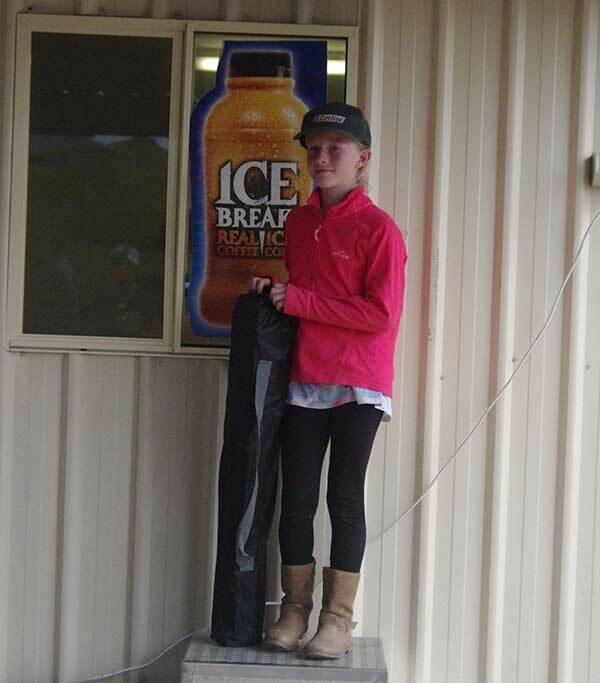 The second of the Lenore Leavey rising star awards went to the Cadet class and it was little Oceane Colangelo that I chose for an outstanding weekend of excellent driving. Kev “the Noise” Davies signing off after a memorable weekend. Thanks to all the volunteers/officials/canteen/stewards & racing families – another cracker! !